I’ve often talked about my kids and their quirks in this blog. 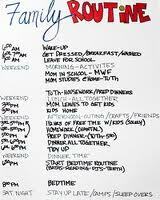 One of the things that helps my whole family function is a very structured routine. We have calendars. We have lists. We have lists that remind people what “clean the bathroom” means. We keep kid-friendly snacks on the second shelf of the pantry. Everyone sits in the same place every night for dinner and everyone who is home that night eats dinner together, even if it means early, late, or takeout. Homework each night gets put in the folder, in the backpack, by the front door next to the shoes and jackets. These kinds of routines keep my kids on task, help me get to most of the things that need to get done each week, and serve as a backup when Dad is in charge or a babysitter is covering. Sometimes, however, my good intentions create their own problems. My youngest son, in particular, is a very literal thinker. Remember in the movie, “Rainman,” when Dustin Hoffman’s character has to watch Judge Wopner at 5 pm? Andrew is a little like that. He isn’t quite so rigid and has better social skills, but he still gets very stressed when we have to change his routine. For instance, when he comes home from school he gives me his folder, gets the comics from the paper, gets his own snack, and eats it while reading the comics and sometimes watching TV for about 30 minutes. After that he does his homework, gets his stuff together for the next morning, and goes off to his own devices. Days that make him miss a part of that routine throw him off more than most. We’ve learned to use a lot of reminders of a change and cues to prepare him before (when possible) and during (as needed). This might mean that I have to bring snacks with us for him to eat in the car at his brother’s practice or keep some sharpened pencils in the glove compartment, but he has generally gotten much better over the years about adapting to change. Bigger transitions mean bigger issues. Last week we got a call that my mother was having a medical emergency and needed to be hospitalized. I am fortunate that she lives close to both my brothers so I knew she was in good hands with them, and I’m familiar with the medical facilities in the area since I grew up there. Unfortunately, my husband has been gone for the last month or so retraining for his civilian job since returning from deployment, so he was not available to assist me. The boys and I made arrangements for a neighbor to care for our dogs and left the next morning to drive the 5 hours to see my mom. I’m the oldest child and only daughter so I feel some responsibility to “manage” things even though my brothers are more than capable. The boys missed a day of school for the trip, which I felt was important as we really were not sure of the prognosis at the time. For almost 10 years my mom lived in the same town we did and the boys have always been quite close to her. My brothers were very concerned about the idea of me taking them to the hospital, given her condition. Luckily for me, my boys have spent a lot of time at hospitals, because my ex-husband worked in one. They’ve helped round on patients since they were toddlers and are very comfortable in medical settings. I prepared them for what they could expect to see and we were blessed that she was doing much better by the time we got there. We visited for awhile and then went to stay with one of my brothers and his family. They graciously rearranged kids and lives to make room for us all and made the boys comfortable. The next day I left the boys with my former in-laws (and oldest son’s grandparents) for the day. I am amazingly grateful that I could call on them to help me out on short notice with not only their “favorite” grandchild (or so they let him think), but also my younger son while I went to the hospital to give my brothers the time they needed to take care of things with their families. My mother was able to be discharged within a few days, but was in no condition to return home by herself to a very rural area with little support. My brothers both have a lot of stairs in their homes and erratic work schedules so we made the decision that she would come and stay with me for awhile until she regained some strength and some projects were completed at her house. We are currently about 10 days in to having my mom, and her dog, stay with us. It’s been an adjustment for all. My mom has always been very independent, and as a former nurse, makes a stubborn patient. I’m also quite used to doing things according to my schedule and priorities and struggle with trying to remain flexible and still making sure that what I need to do gets done. My kids are used to just having me to deal with and now are also dealing with my mom and her habits, beliefs, and “constructive feedback.” It hasn’t been easy for any of us. My younger son has actually done very well. He loves having his Mimi close by and as long as his routine isn’t disrupted too much, doesn’t mind sharing. My older son, who has always been the apple of his Mimi’s eye, is a little harder to read. At 15, he has his own priorities and the way he thinks things should be done. It’s one thing for me to deal with him, but another for my mom. First of all, I hope it has provided an example of how families can and should come together when there is a crisis and a need. In our family history there have been plenty of examples of family stress with divorce, remarriage, custody disputes, etc. My kids understand these issues very well. I hope that this situation helps them to understand that families work together. 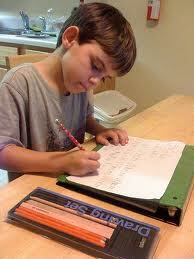 Second, it provides a situation where my children can practice some skills in flexible thinking. I may have my way of doing things, but other ways are acceptable too. There are a lot of things I learned from my mother, so we do them exactly the same. There are other things that I’ve changed along the way. Sometimes this leads to conflict. Even when we don’t agree, I hope that the message of being supportive comes through. Third, they’ve had the opportunity to get to know their uncles and their families a little better. A couple overnights with the cousins, despite the circumstances, was a welcome treat for the boys who have grown up far away from their extended families. It is too soon to tell how all of this will work out long term. My brothers and I agree on many issues, however, my mother has her own plans. As a “perfectly competent adult” (as she likes to remind me), she has every right to do what she wants and knowing my mother, she will. What I do think is that the crisis has opened up some topics for discussion that will be ongoing. I love my family and am so grateful that I had my brothers and sister-in-law locally to handle things in the short term and to coordinate follow-up care with. I’m also grateful for my son’s grandparents who opened their home to the boys on short notice and spoiled them rotten ,my nieces and nephews who doubled up for us, and our family friends and neighbors who pitched in to take care of the dog while mom was in the hospital. They say it takes a village to raise a child, but sometimes it also applies to handling any crisis. So much of what you say rings so true for situations my family 9and extended family) have been in. prayers and best wishes to you all and thank you for sharing your experience and lessons.